Questions › Category: Camping › What are some tips for camping in the rain? Hi, can you give us some tips for camping in the rain? We do car camping and our tent bottom tend to get dirty when it rains. and very hard to clean. We tried using tarp under the tent, but it still got dirty under the tent (I guess the rain water got washed in between). One thing you don’t want to forget is Tarp. Take a big tarp and enough ropes to setup a living/ dining area. Some people also bring additional tarps to cover their tents. Also, if you go in Summer (June/July), it’s mosquito season. We had mosquito repellent spray that helped a bit. We also had mosquito bat that helped get rid of the ones that sneaked inside our tent before going to sleep. If tenting it set up your tent on top of a slope or little hill if you can. Avoid setting up where water may pool. Tarps and ropes are also great. I try to cover my tent however my fire pit is priority as I do all my cooking on it. You’ll also want to think about minimizing the amount of mud you bring into your dry space. Bring a couple of tarps , even if no rain is forecast , they can be used to create shade , as well as keep you dry, they also make great ground sheets , a bag of garbage bags is also handy , you can make rain ponchos , boot liners , cover your fire wood and such . Have fun and stay dry . We always hang a few tarps over our communal area/around the fire pit. Its a tough go when it pours all day and youre stuck in a tent. We also bring a rain jacket and pants in case we still need to get wood, or feel like going for a rainy day hike in the bush. Don’t get rained out and stuck in the tent! Another fun thing to do is leave out a pot in the rain and make bets on how long it will take to fill up/how many times it will fill up. We also make a game of throwing spoons into said pot. Learn to hang tarps. Practice it. Agree with the previous answer, hanging tarps will help. Bring lots of rope and a nice size tarp to hang. Be creative and it will get easier every time! Tarps are a must and lots of rope. Bring along some games and a deck of cards. A good rain poncho is great and you can still go hiking in the rain. In the summer time the rain is a warm rain and you get see nature when it is wet. Good hiking shoes with a good tread is a must. I have never seen a person made of sugar, so we don’t melt if we get wet. Be adventurist. Use your imagination, there is always lots to do. It is important to stay dry by investing in waterproof hiking boots, good rain pants and a Gore tex rain jacket. 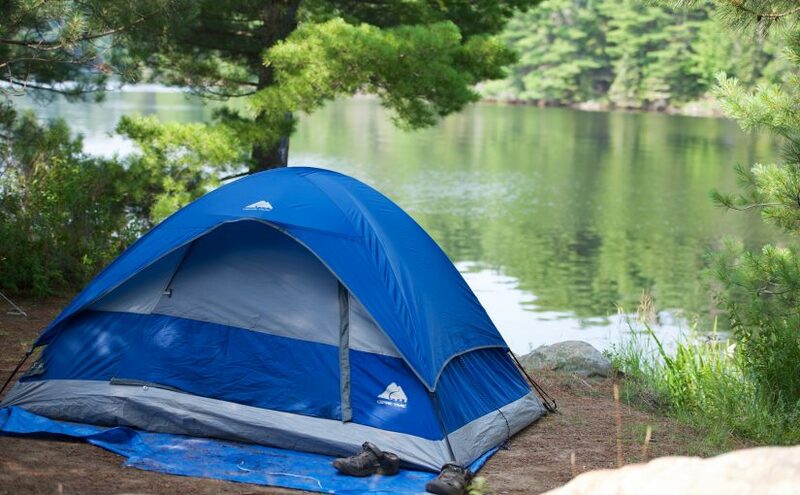 Don’t pitch your tent in a low or hollow area that could collect rain water. High and dry is best. For setting up your tent, use a ground sheet on the bottom and ensure that your (tent) fly cover is breathable and waterproof. We always bring extra tarps as well.